Rochdale Dog Rescue try to prevent dogs being put to sleep at the end of their required 7 day stay. We work closely with one pound who provide us with photographs and essential information about the dogs coming in to their care so that we can contact responsible rescues around the country to find safe rescue spaces for these dogs. The dogs featured here are currently in the pound or in boarding and urgently need rescue spaces. They cannot leave before the stated put to sleep date (unless signed over) in case their owner comes forward. Unfortunately, the majority of dogs are not claimed so we have to find placements within 7 days otherwise they are to be put to sleep. Rochdale Dog Rescue will only use rescues that have a clear and adhered to neutering/spaying policy. They must also vaccinate, worm, flea treat and health check. Beyond this, they need to offer an assessment of the dog's temperament, carry out homechecks, and ideally follow ups.The dogs we are dealing with have already lost at least one home, we want to ensure that they have the best chance of lifetime homes when we seek rescue spaces, hence the criteria. Good rescue spaces are not easy to come by and you can help by informing us of a rescue that fits this criteria and that may help. We DO NOT rehome pound dogs directly to the public, but we can inform you of the rescue a dog has been moved to if you are interested in a specific dog. Storm needs an experienced foster home or a rescue space. Storm is a 3.5 year old female Staffie X, small in size. She was a stray, and was heading to the pound when her owner was located but was unable to take her back. She was signed over, so does not have to do 7 days. She is safe for now, but urgently needs a foster for assessment prior to rehoming, or a rescue space. We do have some background and initial assessment on Storm - She is good with children, not good with most other dogs she has met whilst in our care, has lived with cats and rabbits. Strong on lead, but does know sit, lay down, and some other commands. She's a lovely dog who deserves a second chance. More info is available if anyone is interested. Please email doremiel@aol.com. Higgins needs a rescue space. 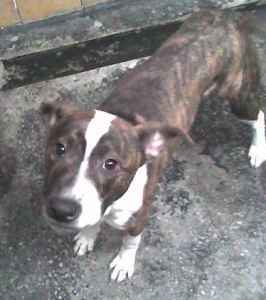 Staffie Cross, male, approximately 12 months old. Just slightly taller than a Staffie, very friendly and seems good with other dogs! 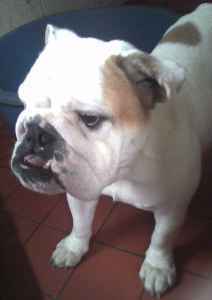 He was moved to boarding on Thursday 18th January 2007 to save him from being put to sleep. He desperately needs a rescue space as soon as possible. Clint needs a rescue space. Labrador/Staffie Cross, male, approximately 5 years old. A beautiful, friendly, happy boy who seems fine with other dogs! He was moved to boarding on Tuesday 23rd January 2007 to save him from being put to sleep. He desperately needs a rescue space as soon as possible. Arnie needs a rescue space. 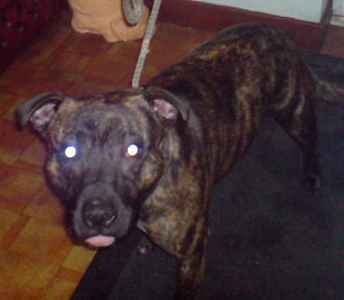 Staffie Cross, male, approximately 3 years old. A very friendly boy who apologises for pulling his tongue out in his photo shoot, he wanted to give kisses! He was moved to boarding on Wednesday 24th January 2007 to save him from being put to sleep. He desperately needs a rescue space as soon as possible. Snoop needs a rescue space. 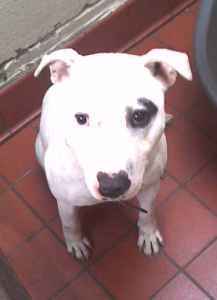 Staffie Cross, male, approximately 18 months old. Snoop was signed over to the pound by his owner as they no longer wanted him. He is said to be good with children and other dogs. He is a very friendly and bouncy boy! He was moved to boarding on Tuesday 30th January 2007 to save him from being put to sleep. He desperately needs a rescue space as soon as possible. Waffles needs a rescue space. 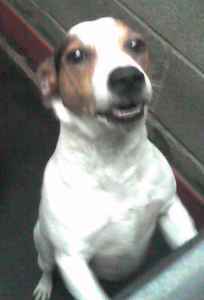 Jack Russell Terrier, male, approximately 2-3 years old. He is only a little boy with a long body and short legs bless him. He is confident and friendly! He will be put to sleep on Tuesday 6th February 2007 if he is not claimed, a rescue space is not secured for him and if there is not the space or funds for emergency boarding for him. Barney needs a rescue space. 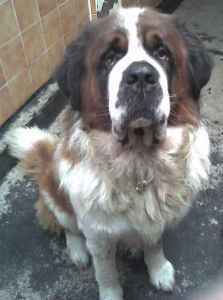 St. Bernard, male, approximately 2-3 years old. What a gorgeous boy he is. He is very friendly, into everything and he likes nothing better than to put his paws on your shoulders and cover you in slobber! He will be put to sleep on Wednesday 7th February 2007 if he is not claimed, a rescue space is not secured for him and if there is not the space or funds for emergency boarding for him. Edgar needs a rescue space. 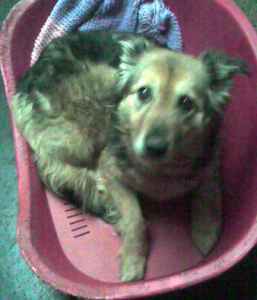 Collie/GSD Cross, male, approximately 10+ years old. Edgar has a sorry tale to tell. He was involved in a RTA and taken to the vets, from there he was re-homed, from there he was passed to another home where he suffered from an epileptic fit and was passed on to the pound. All this in 3 days, poor lad. He is wonderful, very quiet, very loving and very special! Duchess needs a rescue space. 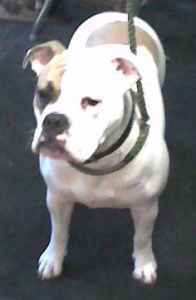 British Bulldog Cross, female, approximately 1 year old. Duchess is a star. She's in very good condition and has a beautiful diamante type collar on, so we are hoping she will be claimed. She's a total babe and likes to climb onto your knee for cuddles! She will be put to sleep on Thursday 8th February 2007 if she is not claimed, a rescue space is not secured for her and if there is not the space or funds for emergency boarding for her. Connie needs a rescue space. Heeler Type Cross, female, approximately 3 years old. A little babe. When you pick her up she wraps her little legs and paws around your arms. She's a bit quiet and bewildered bless her! Delilah needs a rescue space. Dogue De Bordeaux Cross, female, approximately 6 months old. This little girl is a sweetie who like to cuddle up as close as possible. She is currently suffering badly from demodectic mange and is on treatment, poor little babe! Noodles needs a rescue space. 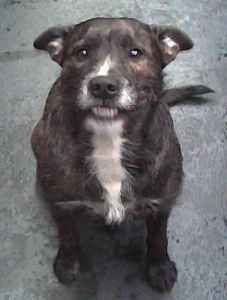 Heeler/Cairn Terrier Cross, female, approximately 7-8 years old. Heeler sized and brindle in colour with a broken coat. She is very friendly! The above dogs are looking for rescue spaces NOT homes as they have been picked up as strays and are unassessed but please see our NON POUNDIES page where you will find details of dogs that ARE looking for homes. Would you like to help Rochdale Dog Rescue but are not in a position to foster or transport? Then could you help a dog whose time in the pound is up or one of our foster dogs in need of veterinary care? Despite all the fantastic efforts of our volunteers sometimes time runs out before a rescue space can be found or transport organised. These dogs have to be moved to emergency boarding kennels at a cost of £4 per day. Occasionally a dog needs essential veterinary treatment before it can move on. Our current special appeal is for assistance with boarding fees for the rising number of dogs we are having to board as a result of the lack of rescue spaces, a knock on effect of the current Bull Breed Crisis. Please see our Help a Poundie page to find out how you can help. HERE to see the specific transport needs to get the following dogs to their rescue spaces. SAFE: He has a rescue space secured. 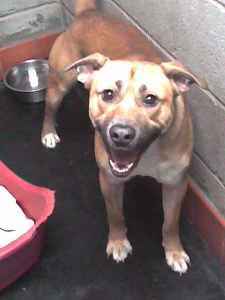 Staffie/Terrier Cross, male, approximately 2-3 years old. This boy is absolutely gorgeous. He has a lovely temperament, seems good with other dogs and he smiles for the camera! 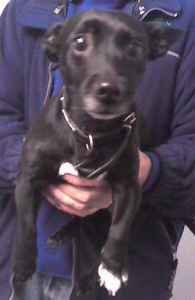 He will be going to a rescue in Leicester on Thursday 1st February 2007 if he is not claimed. 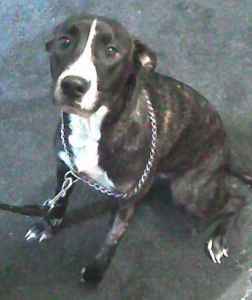 SAFE: She has a rescue space secured. 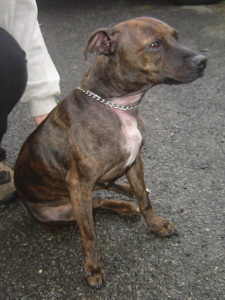 Staffie/Whippet Cross, female, approximately 10-12 months old. What a sweet and friendly girl she is. Unfortunately Devon was hit by a car and spent 2 days in the vets before being brought to the pound. Her front left leg is currently paralysed and she is on medication which may or may not help! She will be going to a rescue in South Wales on Saturday 3rd February 2007 if she is not claimed. SAFE: Cherry has a rescue space secured. British Bulldog, female, age to be confirmed. This little girl is such a sweetie. She is very thin and has a few health problems that will be checked out by a vet on Monday 29th but bless her she doesn't complain! If you have a car and a few spare hours, please take a look at our Transport page to find out what being a volunteer transporter entails, and to see if you could join this group of essential volunteers. ~ Let us know of a rescue that can offer one of our 'urgent' dogs a place. The rescue must have a policy of homechecking potential homes, vaccinating, neutering and microchipping the dogs, and must offer life-time support should the dog ever need to come back into the care of a rescue. ~ Let us know of any experienced dog fosterers. If we know about the dog's background, or it is a young puppy we will consider a foster home either short term or long term until a permanent home is found. ~ Tell other people about this site. The more people who know what is happening in dog pounds around the UK, the more we can hope to make a difference. To contact us please go to the Contact page, where you will find telephone numbers and a contact form.